OVER THE IMPORTED back bar of Yellowstone Club' s Warren Miller Lodge hangs Cold Air Deep Powder, a life-size mural of a family of bison in all stages of life, bulls, cows, calves, and young adults bursting through the snow. Even from 100 feet away, the painting, measuring 8 feet by 16 feet, makes a dramatic statement. 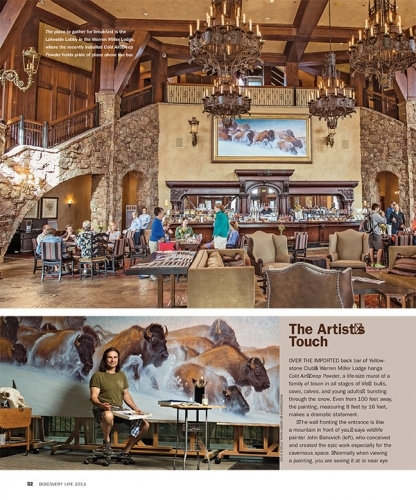 The wall fronting the entrance is like a mountain in front of you,says wildlife painter John Banovich who conceived and created the epic work especially for the cavernous space. Normally when viewing a painting, you are seeing it at or near eye level, and there is no angle on it. But here, with the animals running down a hill, the view represents the way you would experience it in nature. The bison are charging down, about to jump off the canvas and over the bar. The lodge' s architectural elements its stone and prominent wood beams, as well as its color palette played heavily into the bison theme. But for Banovich, the choice to feature this iconic animal had an even deeper significance. Montana is one of the most beautiful, wildest places in the West, where bison still roam free, says Banovich, a native son of the state. From the beginning, I knew the subject of the mural would be bison. It also resonates with the Yellowstone Club' s mission to be a place where families gather.